Not to be confused with Antarctica. The Antarctic (US English /æntˈɑːrktɪk/, UK English /ænˈtɑːrktɪk/ or /æntˈɑːrtɪk/ and /ænˈtɑːrtɪk/ or /ænˈɑːrtɪk/)[Note 1] is a polar region around the Earth's South Pole, opposite the Arctic region around the North Pole. 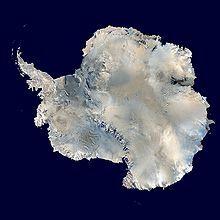 The Antarctic comprises the continent of Antarctica, the Kerguelen Plateau and other island territories located on the Antarctic Plate or south of the Antarctic Convergence. The Antarctic region includes the ice shelves, waters, and all the island territories in the Southern Ocean situated south of the Antarctic Convergence, a zone approximately 32 to 48 km (20 to 30 mi) wide varying in latitude seasonally. 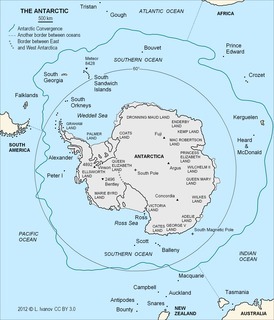 The region covers some 20 percent of the Southern Hemisphere, of which 5.5 percent (14 million km2) is the surface area of the Antarctic continent itself. All of the land and ice shelves south of 60°S latitude are administered under the Antarctic Treaty System. Biogeographically, the Antarctic ecozone is one of eight ecozones of the Earth's land surface. Most of the Antarctic continent is permanently covered by ice and snow, leaving less than 1 percent of the land exposed. There are only two species of flowering plant, Antarctic hair grass and Antarctic pearlwort, but a range of mosses, liverworts, lichens and macrofungi. In December 2009, the growth of tourism, with consequences for both the ecology and the safety of the travellers in its great and remote wilderness, was noted at a conference in New Zealand by experts from signatories to the Antarctic Treaty. 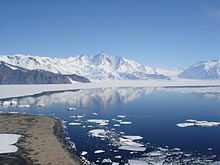 The definitive results of the conference was presented at the Antarctic Treaty states' meeting in Uruguay in May 2010. ^ The word was originally pronounced without the first /k/, but the spelling pronunciation has become common and is often considered more correct. The pronunciation without the first k sound and the first t sound is however widespread and a typical phenomenon of English in many other similar words too. The "c" was added to the spelling for etymological reasons and then began to be pronounced, but (as with other spelling pronunciations) at first only by less educated people. ^ Harper, Douglas. "Antarctic". Online Etymology Dictionary. Archived from the original on 11 January 2012. Retrieved 16 November 2011. ^ "Scientific Committee on Antarctic Research website". SCAR. Archived from the original on 2013-12-14. Retrieved 2015-03-15. ^ "Antarctic Wildlife". Natural Environment Research Council - British Antarctic Survey. Archived from the original on 2012-10-05. Retrieved 2012-11-20. ^ Vanessa Woods (2011-10-14). "Antarctic wildlife". Commonwealth Scientific and Industrial Research Organisation. Archived from the original on 2013-12-14. Retrieved 2012-11-20. ^ "Plants of Antarctica". Natural Environment Research Council - British Antarctic Survey. Archived from the original on 2011-06-07. Retrieved 2012-11-20. 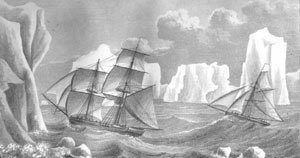 ^ Antarctic Nations Considering New Controls On Ships Amid Tourism Explosion. Archived 2012-01-18 at the Wayback Machine Ray Lilley, The Associated Press, December 8, 2009. ^ Greenland in figures 2009. Statistics Greenland, 2009. ^ Slezak, Michael (26 October 2016). "World's largest marine park created in Ross Sea in Antarctica in landmark deal". The Guardian. Archived from the original on 28 October 2016. Retrieved 28 October 2016. The Balleny Islands are a series of uninhabited islands in the Southern Ocean extending from 66°15' to 67°35'S and 162°30' to 165°00'E. The group extends for about 160 km (99 mi) in a northwest-southeast direction. The islands are heavily glaciated and of volcanic origin. Glaciers project from their slopes into the sea. The islands were formed by the so-called Balleny hotspot. The Patagonian toothfish is a species of notothen found in cold waters between depths of 45 and 3,850 m in the southern Atlantic, Pacific, and Indian Oceans and Southern Ocean on seamounts and continental shelves around most Subantarctic islands. The polar regions, also called the frigid zones, of Earth are the regions of the planet that surround its geographical poles, lying within the polar circles. These high latitudes are dominated by Earth's polar ice caps: the northern resting on the Arctic Ocean and the southern on the continent of Antarctica. The Antarctical realm is one of eight terrestrial biogeographic realms. The ecosystem includes Antarctica and several island groups in the southern Atlantic and Indian Oceans. The continent of Antarctica is so cold and dry that it has supported only 2 vascular plants for millions of years, and its flora presently consists of around 250 lichens, 100 mosses, 25-30 liverworts, and around 700 terrestrial and aquatic algal species, which live on the areas of exposed rock and soil around the shore of the continent. Antarctica's two flowering plant species, the Antarctic hair grass and Antarctic pearlwort, are found on the northern and western parts of the Antarctic Peninsula. Antarctica is also home to a diversity of animal life, including penguins, seals, and whales. The Antarctic Convergence or Antarctic Polar Front is a curve continuously encircling Antarctica, varying in latitude seasonally, where cold, northward-flowing Antarctic waters meet the relatively warmer waters of the subantarctic. Antarctic waters predominantly sink beneath subantarctic waters, while associated zones of mixing and upwelling create a zone very high in marine productivity, especially for Antarctic krill. This line, like the arctic tree line, is a natural boundary rather than an artificial one like a line of latitude. It not only separates two hydrological regions, but also separates areas of distinctive marine life associations and of different climates. There is no Arctic equivalent, due to the amount of land contiguous with the northern polar region. 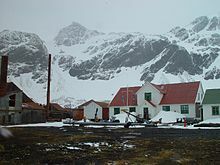 Solveig Gunbjørg Jacobsen was the first person to be born and raised south of the Antarctic Convergence, in Grytviken, South Georgia. The Chilean Antarctic Territory or Chilean Antarctica is the territory in Antarctica claimed by Chile. The Chilean Antarctic Territory ranges from 53° West to 90° West and from the South Pole to the 60° South parallel, partially overlapping the Argentine and British Antarctic claims. It is administered by the Cabo de Hornos municipality in the South American mainland. The Subantarctic is a region in the southern hemisphere, located immediately north of the Antarctic region. This translates roughly to a latitude of between 46° and 60° south of the Equator. 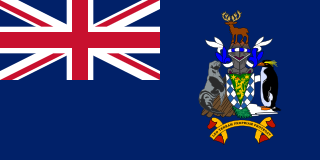 The subantarctic region includes many islands in the southern parts of the Indian Ocean, Atlantic Ocean and Pacific Ocean, especially those situated north of the Antarctic Convergence. Subantarctic glaciers are, by definition, located on islands within the subantarctic region. All glaciers located on the continent of Antarctica are by definition considered to be Antarctic glaciers. 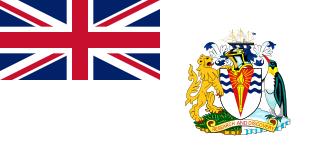 There are seven sovereign states who currently maintain de jure, largely symbolic territorial claims in Antarctica: Argentina, Australia, Chile, France, New Zealand, Norway and the United Kingdom. These countries have tended to place their Antarctic scientific observation and study facilities within their respective claimed territories; however, a number of such facilities are located nowhere near the sectors claimed by their respective countries of operation, and there are multiple other countries such as Russia and the United States who, despite having no territorial claim of their own anywhere in Antarctica, have constructed large research facilities within the sectors claimed by other countries. The Southern Ocean, also known as the Antarctic Ocean or the Austral Ocean, and the "Southern Icy Ocean".</ref> comprises the southernmost waters of the World Ocean, generally taken to be south of 60° S latitude and encircling Antarctica. As such, it is regarded as the fourth largest of the five principal oceanic divisions: smaller than the Pacific, Atlantic, and Indian Oceans but larger than the Arctic Ocean. This ocean zone is where cold, northward flowing waters from the Antarctic mix with warmer subantarctic waters. The Antarctandes, also known as the Antarctic Peninsula cordillera, is the mountain range that is located on the northern Antarctic Peninsula, in the Graham Land and Palmer Land regions of Antarctica and may also be considered to extend across the continent.